These honey buffalo wings fall right off the bone and into your mouth! They start in the crockpot and end up either on the grill or broiler slathered in spicy honey buffalo sauce. **If you are using frozen wings, please make sure they are COMPLETELY thawed and dry. Add the dry wings to a slow cooker and sprinkle the combined rub ingredients on them. Using your hands, rub the spices into the wings. Pour the sauce ingredients over the wings and toss gently. Cook on HIGH for 2 – 2 1/2 hours for 2.5 lbs of wings, up to 3 hours for 4 lbs. Remove the wings from the slow cooker and place on a baking sheet lined with parchment paper. Scoop out 1 cup of the remaining sauce from the slow cooker and pour into a small saucepan over medium heat. Add 1/4 cup Buffalo sauce. Remove a few tablespoons of the sauce from the saucepan and place in a small bowl. Add 2 Tablespoons of Organic Cornstarch or Arrowroot and whisk until there are no lumps. Pour this into the saucepan and whisk to combine. Cook for approx. 4-5 minutes or until the sauce thickens. Turn on the broiler of your oven and brush the wings with the sauce and put on the top rack to brown. Broil them for 2-4 min or until caramelized. Turn the wings over, brush with more buffalo sauce and repeat on the other side. 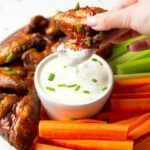 Place the wings on your favorite plate alongside some Ranch or Blue Cheese dressing and some carrot and celery sticks.